Copying and pasting is the simplest method to get your voter list into Electionbuddy. We strongly recommend this method for smaller voter lists (under 5000 voters), or if you are struggling with the CSV import function. One email or cell phone number per box/line is allowed. Arrange your excel data in the same order that you see in the Electionbuddy voter list table (be sure to remove any extra columns). Your excel list should have the same number of columns as the electionbuddy list. Be sure to remove any headings you have at the top of your excel list, or you will have an error when you copy and paste. 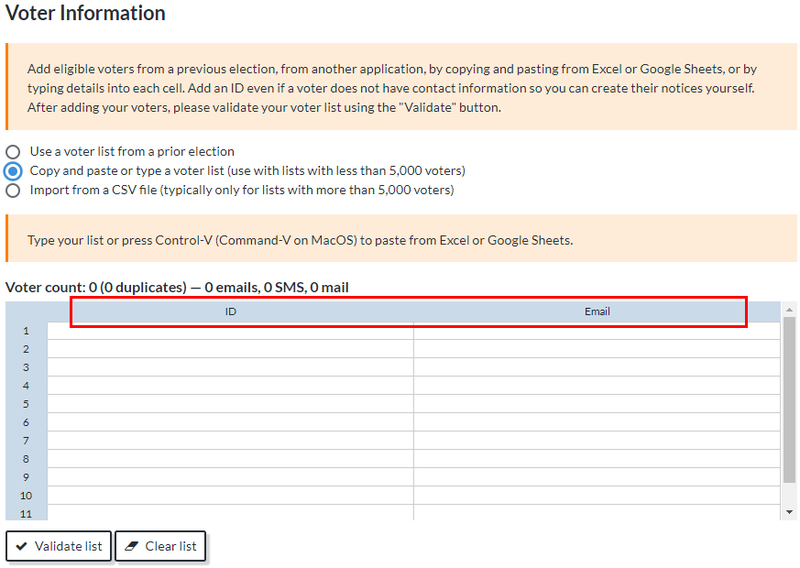 In the above electionbuddy voter list, your spreadsheet should have data arranged with your ID information in the first column, and email information in the second column, with no heading rows. Remove all the spaces in any email addresses or cell phone numbers. Some special characters, such as "," and "&", may cause issues. It's best to remove them. Mailing addresses have very specific formatting around them, including required/optional fields and specific character limits, see Formatting Tips for Mailing Addresses for more details. For Windows users, press "CTRL" + "C" simultaneously on your keyboard. For Mac users, press "CMND" + "C" simultaneously on your keyboard. For Windows users, press "CTRL" + "V" simultaneously on your keyboard. For Mac users, press "CMND" + "V" simultaneously on your keyboard. Open Ele ctionBuddy, and in the voter list field, and using the keyboard shortcuts, paste the copied list into the upper left cell. You don't need to select all the cells, just the upper left one. Click outside the field to review your list. Scroll through the list to review for errors. Any errors will be highlited just under the Validate List Button. Make sure that you only copy and paste the columns in excel that match the columns in electionBuddy. If you have errors, and your list is very large, it will probably be easier to edit your Excel list and copy and paste a second time, as opposed to fixing directly in the electionbuddy list.